According to this week’s market reports, the median resale price in Manhattan increased 1.3 percent year-over-year to pass $1 million for the first time, and New York is the world’s most expensive city to rent a co-working space. In Manhattan, home prices contracted at both extremes in May. Prices at bottom of the market prices increased 11.8 percent year-over-year while luxury market prices dropped 3.4 percent. Median resale prices climbed to $1 million in Manhattan and $575,574 in Brooklyn. Read the full report here. In the second quarter of 2017, 350 contracts above $4 million were signed. That’s just about equal to the 343 signed in the same quarter last year. Read the full report here. The absorption rate for Manhattan apartments fell to 6.3 months in June, but remained 11 percent higher than a year ago. Read the full report here. Home prices rose faster than weekly wages in 87 percent of markets in the second quarter of 2017, with the median home price rising 7.7 percent from a year ago to $253,000. Brooklyn is one of the least affordable markets, requiring 125 percent of average wages to purchase a median-priced home. Read the full report here. 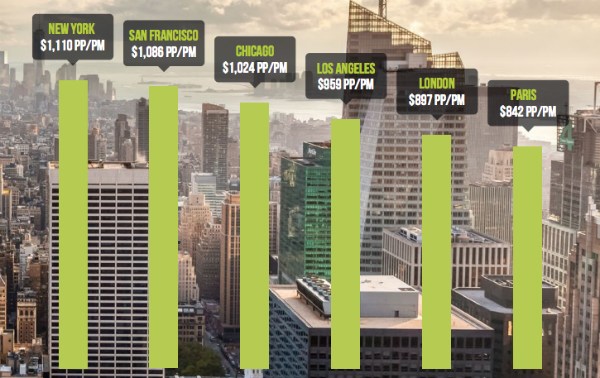 New York is the most expensive market for flexible office space, at a rate of $1,100 per person per month, followed by San Francisco and Chicago. That’s a 24 percent increase from 2016. Read the full report here.